KRVM 91.9 is a non-commercial, public radio station that is 24/7 music oriented. In addition, KRVM supports the community with an educational broadcasting program and public service announcements to support local community organizations. KRVM 91.9 serves the Eugene/Springfield area with translators in Oakridge, Reedsport and Florence. Our primary audience is women and men between the ages of 35-55, entrepreneurs, working class to include independent contractors, retail and office workers. Target demo: Primary 35-55 (women & men), secondary 18-35 (men and women) and seniors 55+ (men & women). Underwriting announcements are brief, informative and kept to a minimum creating an environment where the listener is tuned in longer. Underwriters are the backbone of KRVM. Our underwriters not only support educational opportunities for students and adult volunteers, but also support KRVM’s continuing effort to offer the widest variety of music and entertainment, and to air local community public service announcements. Alternative rock band Death Cab for Cutie is coming to Eugene touring to promote their just-released ninth studio album “Thank You for Today”. The Grammy award nominees are set to perform at Eugene’s Hult Center for the Performing Arts on Monday, September 24. Brandi Carlile visited us here at KRVM back in 2005 while promoting her first album. Gee, that’s been a while! She has two shows scheduled for the Edgefield in Troutdale this summer. We hope to see you there! Johnny Etheredge grew up — to the extent that he ever grew up — in Texas and Southern California. As a youngster, in East Texas, he lived for the nighttime, when he could listen to rock’n’roll and rhythm’n’blues on distant radio stations in Chicago and New Orleans. 5 O’Clock World will get your weekend off to a tuneful start. Let Adam help you unwind after a hard day at work with a handcrafted mix of eclectic rock and cool jazz. You’ll hear artists and bands ranging from Nick Drake to Nellie McKay, from the White Stripes to Wynton Marsalis — music from around the world and around the community. KRVM is a listener-supported public radio station licensed to Eugene School District 4J. From our very beginnings, KRVM has worked to enrich the quality of life — and enhance the variety of music — in our community. For area students, KRVM serves as a radio classroom-of-the-air, offering the opportunity to learn and practice first-hand the skills required to successfully produce, write, voice, and engineer radio programming. 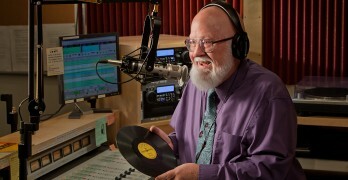 In addition, KRVM provides a wide variety of musical and informational programming — round-the-clock and daily — to a loyal audience throughout western Oregon. (The RVM in our call letters stands for “Real Variety in Music.”) Our instructional and broadcast operations depend on financial support from listener members and area businesses who understand the importance of public radio to a varied and vital community. For more information on how KRVM serves the community, click here. KRVM operates an instructional and broadcast studio at Sheldon High School, and ancillary studios at Mohawk High School and Spencer Butte Middle School. Instruction is available to students from any school in our area who are eager to learn and able to come to our main studio at Sheldon High School. The first words ever spoken on FM radio in the Pacific Northwest were spoken on KRVM. The date was December 6, 1947. Today, KRVM broadcasts 24/7, Keeping Real Variety in Music. KRVM’s HD stereo signal (at FM 91.9) reaches from south of Cottage Grove to north of Corvallis. KRVM FM Eugene is broadcast in HD and simulcasts on KSYD FM (92.1) in Reedsport-Coos Bay, KAVE FM in Oakridge (88.5), and K211BP (90.1) in Florence. KRVM also broadcasts a second stream of music on our HD2 channel. KRVM AM at 1280 on the dial is programmed and funded by Jefferson Public Radio and includes the National Public Radio network, Eugene School District 4J Board Meetings, and local high school sports. Information about 4J school board members and the board’s open meetings can be found on the 4J web site.